How to humanely kill the fish you keep AND Give the fish you release a fighting chance from a welfare perspective. Many of us love fishing for snapper, be it to get a feed or to simply be out on the water with friends. It is important though to fish responsibly, and that means being aware of the impacts our fishing can have on this iconic Australian species. This article provides information to help those targeting snapper to fish responsibly and sustainably. It discusses what to do to maximise the eating quality of any fish caught. It also explains the issues to consider when catching a fish and then releasing it. Many anglers think that as long as the fish is put back in the water and swims away, it is OK. But this may not be the case. Many are not. on issues to consider when releasing a fish, before the fish has been caught and then what to do (and not do) after it has been caught to give it the best chance of survival when released. Where possible, the authors of this article have used scientific research conducted specifically on snapper (Pagrus auratus) to base their comments on. Where such research is not available, research conducted on other species of fish considered relevant has been mentioned. As with all recreational fishing, anglers must observe all relevant local recreational fishing regulations, including daily bag limits and permissible methods of capture. Divers coming up from depths must always be aware of ascending too quickly, as the rapid change in pressure can cause any trapped air to rapidly expand causing damage to surrounding tissues, a condition known as “barotrauma”. Snapper and many other fishes too can be affected by barotrauma if they are brought to the surface from depths. Snapper have a closed swim bladder (sometimes called a gas bladder) that under normal conditions allows them to be “neutrally buoyant” in the water column so that they neither sink nor float at any given depth. The amount of gas in the swim bladder is controlled through a complex system of blood vessels, gases dissolving out of the blood to fill the swim bladder and dissolving into the blood to empty it. Understandably, this is not a quick process and hence they cannot adapt quickly to changes in water depth or pressure as there is no “release valve” to quickly dump gas. While air can be quickly “dumped” from a diver’s Buoyancy Compensation Device (BCD), a snapper cannot do this. It has been suggested that fish require between 4 – 48 hours to adjust the volume of their swim bladder, and that fish would need to be brought up at a maximum rate of 2.5 metres per hour (4 hours for 10m) to allow for buoyancy regulation (Rummer and Bennet, 2005). This means that bringing a fish up slowly won’t help, as has been suggested elsewhere. While the risk of barotrauma increases with increasing depth, there is evidence that any snapper caught at depths greater than 10 metres is at risk of being impacted by barotrauma. In 2012, researchers from NSW conducted a study examining the effect of barotrauma on survival of snapper caught as part of the recreational snapper fishery in Coffs Harbour NSW (Butcher et al. 2012). Working with a local snapper fishing tournament, the study found that 61 of 315 snapper (of average length 26.5-95.5cm) which were caught at depths ranging from 6 to 60.5m had clinical signs of barotrauma. The shallowest depths where clinical signs were observed was 11m. The same study found that all snapper caught by angling at 15m or greater had a distended abdomen and/or a prolapsed cloaca (i.e. signs of barotrauma), and 95% of snapper caught at depths greater than 20m had a ruptured swim bladder (the tear being from 0.1 – 3.0cm in length). Fortunately, the damage was less the shallower the fish were caught, but even when catching fish from 15m, one in every five fish had a ruptured swim bladder. Depending on the depth, many fish had other damage. At depths greater than 20m this included organ displacement (65.6%), liver (84.4%), peritoneal cavity haemorrhages (40.6%), and gastric herniation extending into the buccal cavity (56.0%) or, less frequently, out of the mouth (9.4%). This sort of damage can have short and long term impacts on the fish being caught. How quickly the fish were brought to the surface did not help. “Displacement injuries are the first to occur as the expanding swim bladder increases in volume and begins to contact internal organs and systems. Continued decompression results in more severe compaction injuries as the swim bladder becomes confined by the body wall and pressure on organs increases dramatically”. There is also unpublished data suggesting that evidence of damage to the male reproductive organs (testes) has been observed in snapper coming up from depths as shallow little as 11m. Therefore catching snapper that are coming into spawn, or spawning, will cause stress. This stress will increase if fish are being caught from depths and suffering batotrauma. 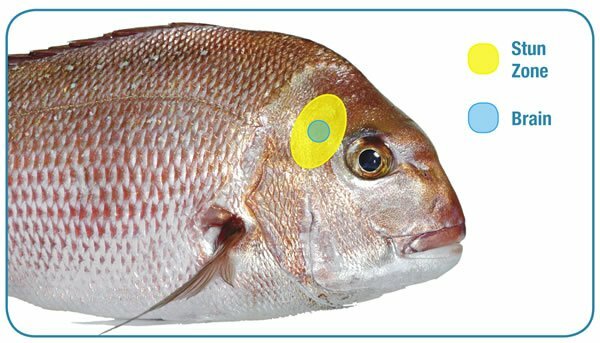 There appears to be no way an angler can reduce the possibility of barotrauma occurring in a snapper if it is caught from depths greater than 11m. Because of this, the best approach when catching snapper from depths is to stop fishing when sufficient fish are caught to meet the needs of the angler, or when “bag” limits are reached, whichever comes first. These changes can result in reduced eating quality of the fish and a shorter storage life. Hence if the fish is to be kept and those who eat it impressed, gear should be used that gets the fish in quickly once caught, thereby minimising the duration of exercise (and stress) the fish goes through. Studies in other species of fish have shown that a proportion of fish that get exhausted during the fight to be captured will die after being released, even if released as soon as it gets to the surface. In one study on rainbow trout (Oncorhynchus mykiss) (Ferguson and Tufts 1992), the researchers exhausted fish in a tank and then compared the survival of these fish with “control” fish (i.e. fish that had not been exhausted). While 100% of the control fish survived after 12 hour, 12% of the exhausted fish died. And these fish were in tanks. It is quite possible that more fish may have died if predators had been around during the recovery period, as occurs when angling. Interestingly, these researchers also showed the dramatic impacts of holding a fish out of the water (“air exposure”) after exhaustive exercise. Some of the fish exhausted as described above were held out of the water for 30 seconds before being put back in a recovery tank. Another group was held out of the water for 60 seconds. After exhausting the fish and then holding them out of the water for 30 seconds, 38% of the fish died. Air exposure for 60 seconds led to 72% dying. This shows the dramatic impact of air exposure to an exhausted fish. Minimise the stress the stress placed on each fish caught by getting it in quickly. It’s better in all ways. Deep hooking, where the fish swallows the hook and it catches in the wall of the gastro-intestinal tract (e.g. stomach, oesophagus) or in the gills, greatly reduces the chance of survival for fish that are to be released. A study on juvenile snapper found that 52% of deep-hooked fish die after release, compared to only 3% in shallow-hooked fish (Grixti et al. 2010). The type of hook used can influence the number of fish gut hooked. 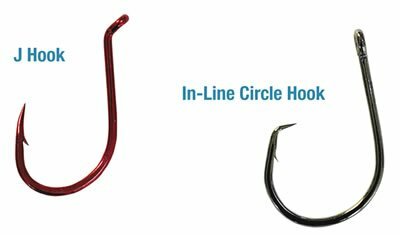 In-line circle hooks are becoming increasingly popular over the more conventional ‘J’ style hook. Figure 1 shows a conventional ‘J’ hook and a circle hook. Figure 1 – A conventional ‘J’ hook on the left and an in-line circle hook on the right. The authors of this article have used large (6/0 and 7/0) in-line circle hooks for a number of years to catch snapper, mainly in Western Port. Rarely has a fish been hooked in any area other than the mouth. While specific, scientifically validated studies have not been conducted on larger snapper, we strongly believe the use of large in-line circle hooks has the potential to minimise gut hooking and also reduce the catching of undersize snapper. There are a few important points though when using circle hooks. Firstly, the gape of the hook must be kept relatively clear to allow hooking to occur. So don’t use too big a bait. Secondly, instead of jerking the line when a bite is felt, anglers should gently load up the rod. Jerking the line can pull the hook out of the mouth and miss the fish. Gently loading causes the hook to catch on the flesh of the jaw as it pivots outwards. Because of their design generally the hook will not back out on its own as the fish is brought in. If the fish is being caught to be eaten, it is best if it is killed quickly. It will taste better and it’s better for the fish. Putting a fish in a live well after catching it will cause further stress and result in significantly increased cortisol levels (Pankhurst and Sharples 1992). There should be no need for an angler, fishing recreationally for a feed, to leave a fish thrashing around on a deck of a boat of the planks of a pier. Such thrashing and slow death will cause a reduction in the quality of the fish when eaten and is likely not so great for the fish itself. The following two methods of killing a snapper are considered to be humane and also result in rapid loss of consciousness in the fish. It is important to note though that in both methods the heart will continue to beat for some time, hence bleeding will still occur. Knocking a fish on the head with a club or ‘priest’ is a quick and easy way to stun a fish and render it senseless. Hitting the skull at high speed and having sufficient weight in the club is important to “jolt” the brain. It is the internal movement of the brain relative to the skull that caused the damage and results in a rapid loss of consciousness (Robb and Kestin 2002, Poli et al. 2005). Fish can though “wake up” after being stunned, so they should always be bled by cutting the throat or across one or both sets of gill arches and/or spiked (pithed) after stunning to ensure they never regain consciousness. Figure 3 indicates the area where a quick, sharp blow should result in an effective stun. It is important when stunning not to hold the fish too firmly as it is the movement of the brain inside the skull that does the damage. Essentially, the brain is “shaken”. Holding the head too firmly will reduce the degree of movement. 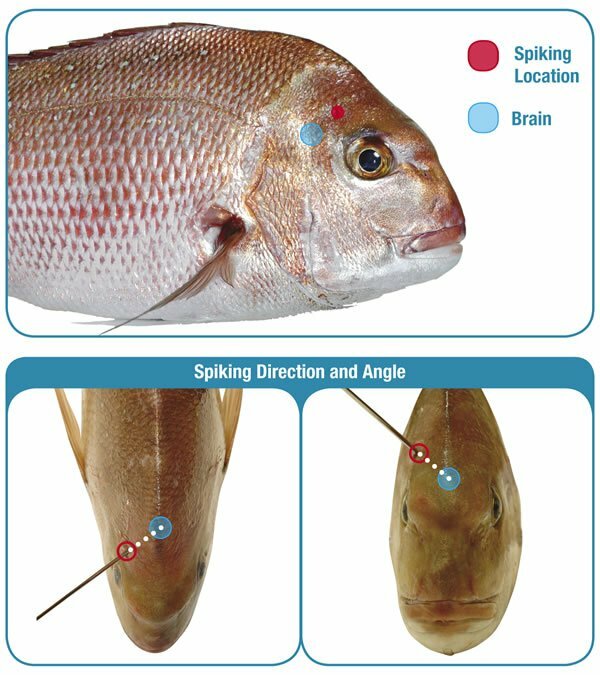 Spiking the brain (‘iki jime’) requires more skill and precision than stunning the fish. It immediately destroys the brain though (Robb and Kestin 2002, Poli et al. 2005). The brain is located deep in the head of the fish, and is protected by a bony case. The thickness of the bone varies. Trying to spike the fish by going directly in from the outside will hit some of the thicker bone and the likelihood of injuring the fish, but not killing it, is high. A much better approach is to come down from an angle. This ensures the spike only has to go through the much thinner bone above the brain, resulting in a quicker and easier kill. The landmarks for where to spike and the angle to insert the spike are shown in Figure 4. The initial point of penetration of the spike is through skin and muscle which will feel soft and not bone. If the spike at the point of penetration hits hard bone, it is not in the right place. Another important way to ensure fish keeps in prime condition is immediate chilling after killing to a temperature slightly above the freezing point and maintaining this temperature until it is eaten (Sigholt et al. 1997). An easy way to chill fish to optimise its quality after killing is by putting it into an ice slurry, which consists of ice and water in ratios of greater than or equal to 1:1 (ice:water). Ice-water slurry has been shown to be an effective means of storing fish to maximise shelf life and quality (Rodriguez et al. 2005). An ice slurry can be made by filling a suitable container (preferably insulated, such as an esky or insultated fish bin) with normal cubed or crushed ice. Addition of ice to water at ratios of greater than or equal to 1:1 (ice:water) forms an ice slurry with water temperatures around -2°C to 2°C, with the final slurry temperature depending on the water temperature before addition of the ice, the quantity and temperature of the ice used, and whether the slurry and/or ice is made up with freshwater or seawater. For cooling fish, ice slurries made using ratios of 2 or more parts freshwater ice to 1 part seawater are usually recommended for best effect, producing a slurry with a temperature ending up around -0.5°C. Ice slurries made with freshwater ice and freshwater will produce a temperature of no lower than 0°C. Using a little seawater to make up the ice slurry can cause the temperature of the ice slurry to get below 0°C. The fish should be killed first though – putting a live fish into an ice slurry before killing may actually prolong its death. If fish are not killed first, the time taken for fish to die in an ice slurry may adversely affect some physicochemical properties, for example Acerete et al. (2009) reported that lactate and cortisol levels in European sea bass killed in ice slurry were significantly higher than in undisturbed fish and were comparable to levels in fish killed by carbon dioxide or asphyxia. Similarly, Bagni et al. (2007) reported that death by asphyxia (the usual way the fish die if not killed first) in chilled water (i.e. an ice slurry) was highly stressful based on data on rigor mortis development in crowded and uncrowded groups of sea bass and sea bream. Although some studies report improved flesh quality and shelf life in fish killed by ice slurry compared to some other methods, it has been suggested that these benefits “could be obtained equally well if the fish were killed before chilling” (Robb and Kestin, 2002).Temperate species that are acclimated to lower water temperatures may take longer to lose brain function when placed in an ice-water slurry than if they were left on deck (Robb and Kestin 2002), and muscle contraction in response to the low temperature of an ice-water slurry may give the appearance that a fish is dead when it is actually still alive (Roth et al. 2009). For big fish, opening the gut cavity first will help ensure even quicker cooling but cutting the intestine should be avoided as it may release gut contents and lead to quicker spoilage. If the intestine is inadvertently cut, then all intestinal contents should be removed and the cavity well rinsed before the fish is put into the ice slurry. Keeping lines tight and avoiding slack is important to reduce the chances chances of deep hooking fish, even when using circle hooks. Research on black bream found that fishing with a slack line was almost twice as likely to result in deep hooking as fishing with tight lines (Grixti et al. 2007). As previously noted, gut hooked fish have much lower survival chances if released. 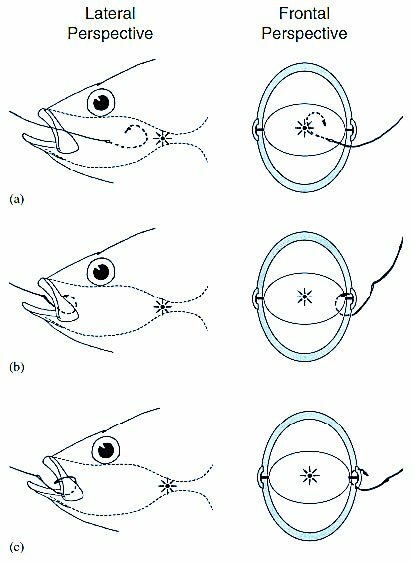 If not using in-line circle hooks, setting the hook immediately when a fish accepts the bait by fishing a tight line probably restricts the time available to chew and swallow the bait, decreasing the chance of deep hooking (Grixti et al. 2007). However, this may not be effective with large, hungry snapper that engulf a bait. No matter what the species of fish being caught, air exposure is harmful to the fish. The gills of the fish are quite delicate. In the water, they are supported and have a large surface area across which gas exchange (e.g. oxygen, carbon dioxide) can occur. When a fish is taken out of the water, the delicate structure collapses. The effect of air exposure can be dramatic as discussed above in the study by Canadian researchers working with rainbow trout (Ferguson and Tufts 1992) where it was found that 38% of fish that were exercised to exhaustion and then held out of water for 30 seconds died within 12 hours, and the mortality rate increased to 72% when exhausted fish were held out of water for 60 seconds. These researchers concluded that the brief period of air exposure which commonly occurs in many catch and release fisheries is an important additional stress in an exhausted fish and may ultimately have a significant impact on the number of released fish which survive. A similar study in rock bass found that fish held out of the water for 1-3 minutes following exhaustive exercise showed significant cardiac disturbances and took up to 4 hours for normal cardiac output to return (Cooke et al. 2001). Anglers should do everything possible to avoid air exposure in any fish they plan to release. Seconds really do count. One useful way to show the significance of this is for an angler hold his or her breath when they lift a fish out of the water and only breath again once they’ve released it. This is essentially what the fish is doing. If a fish is to be released it should be handled as little as possible. Ideally it should not even be taken out of the water. If a net is used, it should be made out of knotless material to avoid damaging the skin of the fish. Many anglers do not realise that the delicate outer layers of the skin sit OVER the scales, and not under them. Rough, knotted nets do more damage than knotless and can cause damage to fins and scale loss that can affect post-release mortality rates (De Lestang et al. 2008, Barthel et al. 2003). One study done on bluegill (Lepomis macrochirus) found mortality rates for fish landed with fine, knotted nets was 14% compared to 10% for fish landed with coarse knotted nets, 6% for fish landed with knotless nets, and 4% for fish landed with rubber nets. Interestingly, none of the fish that were landed without a net died in this study (Barthel et al. 2003). And if a fish must be picked up, it should be supported and not held by only the mouth or tail. In a study done on barramundi, it was found that lifting a fish up by “lip grippers” only caused separation between the second and third vertebrae, especially on the ventral side (Gould and Grace, 2009). Barramundi didn’t seem to recover from this. The weight of the fish should be supported by holding it horizontally, and getting it back into the water as quickly as possible if it is to be released. All of us love to get the picture of the “big one”. However, hopefully after reading this anglers will be aware that holding a fish up for a photo can have an impact on it, particularly if it is to be released. For fish that have been caught to be eaten, it is not an issue. Kill the fish first and then take the photo, either before or after putting it in an ice slurry. For fish that are to be released, consider taking a photo with the fish in the water. If the photo simply has to be taken with the fish out of the water, have everything ready to go before the fish is even caught. Then, when taking the photo remember that every second the fish is being held up it is impacting its possible survival when released. If a fish is good enough to be photographed, it is good enough to be given every chance of swimming off and surviving. The authors also thank Dr Paul Butcher of Fisheries NSW for his comments on snapper and barotrauma which assisted in the production of this article and the brochure and Justin Graham of Huxbury Quinn for the excellent and timely work done on graphics. Dr Butcher is a co-author of the recently published document Recreational Fishing Catch and Release Handbook. Barthel, B., Cooke, S., Suski, C., & Philipp, D (2003). Effects of landing net mesh type on injury and mortality in a freshwater recreational fishery. Fisheries Research, 63, 275-282. Butcher, P. A., Broadhurst, M. K., Hall, K. C., Cullis, B. R., & Raidal, S. R (2012). Assessing barotrauma among angled snapper (Pagrus auratus) and the utility of release methods. Fisheries Research, 127-128, 49-55. Carragher, J., & Pankhurst, N (1991). Stress and reproduction in a commercially important marine fish, Pagrus auratus (Sparidae). In Proceedings of the Fourth International Symposium on Reproduction in Fish (pp. 253-255). Presented at the Proceedings of the Fourth International Symposium on Reproduction in Fish, Sheffield. Cleary, J., Pankhurst, N., & Battaglene, S (2000). The effect of capture and handling stress on plasma steroid levels and gonadal condition in wild and farmed snapper Pagrus auratus (Sparidae). Journal of the World Aquaculture Society, 31, 558-569. Cooke, S. J., Philipp, D. P., Dunmall, K. M., & Schreer, J. F (2001). The Influence of Terminal Tackle on Injury, Handling Time, and Cardiac Disturbance of Rock Bass. North American Journal of Fisheries Management, 21, 333-342. Cooke, S. J., & Suski, C. D (2004). Are circle hooks an effective tool for conserving marine and freshwater recreational catch-and-release fisheries Aquatic Conservation: Marine and Freshwater Ecosystems, 14(3), 299-326. Cooke, S., & Suski, C (2005). Do we need species-specific guidelines for catch-and-release recreational angling to effectively conserve diverse fishery resources Biodiversity & Conservation, 14, 1195-1209.
de Lestang, P., Griffin, R., & Allsop, Q (2008). Effects of two different landing nets on injuries to the barramundi Lates calcarifer, an iconic Australian sport fish. North American Journal of Fisheries Management, 28, 1911-1915. Ferguson, R. A., & Tufts, B. L (1992). Physiological Effects of Brief Air Exposure in Exhaustively Exercised Rainbow Trout (Oncorhynchus mykiss): Implications for “Catch and Release” Fisheries. Canadian Journal of Fisheries and Aquatic Science, 49, 1157-1162. Gould, A., & Grace, B. S (2009). Injuries to Barramundi Resulting from Lip-Gripping Devices in the Laboratory. North American Journal of Fisheries Management, 29(5), 1418-1424. Grixti, D., Conron, S. D., & Morison, A (2010a). Post-release survival of recreationally caught snapper, Pagrus aurata, in Port Phillip Bay, south-eastern Australia. Fisheries Management and Ecology, 17(1), 1-9. Grixti, D., Conron, S. D., & Jones, P. L (2007). The effect of hook/bait size and angling technique on the hooking location and the catch of recreationally caught black bream Acanthopagrus butcheri. Fisheries Research, 84(3), 338-344. Pankhurst, N., & Sharples, D (1992). Effects of capture and confinement on plasma cortisol concentrations in the snapper, Pagrus auratus. Australian Journal of Marine and Freshwater Research, 43, 345-356. Poli, B., Parisi, G., Scappini, F., & Zampacavallo, G (2005). Fish welfare and quality as affected by pre-slaughter and slaughter management. Aquaculture International, 13, 29-49. Robb, D., & Kestin, S (2002). Methods used to kill fish: field observations and literature reviewed. Animal Welfare, 11, 269-282. Rodriguez, O., Losada, V., Aubourg, S. P., & Barros-Velazquez, J (2005). Sensory, microbial and chemical effects of a slurry ice system on horse mackerel (Trachurus trachurus). Journal of the Science of Food and Agriculture, 85(2), 235-242. Roth, B., Imsland, A., & Foss, A (2009). Live chilling of turbot and subsequent effect on behaviour, muscle stiffness, muscle quality, blood gases and chemistry. Animal Welfare, 18, 33-41. Rummer, J. L., & Bennett, W. A (2005). Physiological Effects of Swim Bladder Overexpansion and Catastrophic Decompression on Red Snapper. Transactions of the American Fisheries Society, 134, 1457-1470. Sigholt, T., Erikson, U., Rustad, T., Johansen, S., Nordtvedt, T., & Seland, A (1997). Handling Stress and Storage Temperature Affect Meat Quality of Farmed-raised Atlantic Salmon (Salmo Salar). Journal of Food Science, 62, 898-905.